"You keep going, always trying to find something different, but it's always the same. Yeah, it's like standing in a heck of a rain waiting for a trolley. One comes by, ding, all full up. You wait for the next one. Ding ding ding goes the trolley, 'sorry, no room for you.' And they keep coming, ding, ding, ding, ding, ding, ding, and you're still there, still waiting"
One of the classic techniques in film noir is to show a desperate situation and then use flashbacks to bring us back to the present day. The Long Night, a remake of Marcel Carnes' 1939 film, Le Jour Se Leve, makes extensive use of this technique, giving us flashbacks within flashbacks. Although complex in structure, the film is not difficult to follow at all. Henry Fonda stars as Joe Allen, a WWII vet who is working at a blue collar job doing sandblasting in an Ohio steel town. At the beginning of the film, a shot rings out, and we see a nattily dressed pre-horror Vincent Price stumble out of Allen's apartment and fall down a winding flight of stairs, coming to rest at the feet of a blind man, played by the ubiquitous Elisha Cook, Jr. The camera travels back to Joe and we begin a nightmarish siege of the apartment building by a gang of trigger-happy police. As they begin to hail the apartment with bullets, we travel via flashback to see how Fonda got into this predicament. The performances in this film are outstanding. Fonda gives us his usual good guy, but at times he displays a slightly harder edge that would be put to good use years later in Once Upon a Time in the West. Circumstances and problems with romance increase his frustration, which combined with what would now be termed post-traumatic stress from the war makes for a fully-rounded character who is an unwilling but doomed participant in the action of the film. Barbara Bel Geddes as his girlfriend JoAnn, a blonde Price as the deceitful stage magician Maximilian and Ann Dvorak as Price's disillusioned assistant all give terrific readings of their roles, making this film a good character study. The camera work is also sure-handed, with a number of striking shots. Notable is the overhead view of the winding staircase full of cops and rubberneckers who scatter in every direction as Fonda begins firing back. When we move from the street to the apartment and vice versa, the camera moves and then blurs as if we are omnisciently traveling from one spot to another without a cut. The production design by Eugene Lourie (The Grand Illusion and Rules of the Game) is also noteworthy. The mattes and model work are flawlessly done and give every indication of being location shooting. The use of light and shadow in the climactic scene as Fonda leans from his window to address the crowd below is quite gorgeous and an unforgettable set piece. The score by Dmitri Tiomkin almost entirely consists of variants on the Andante from Beethoven's Seventh Symphony. By changing harmonies and tempo, Tiomkin manipulates this stately theme in an immense number of ways, from a romantic love theme to dramatic action music, to implication of the inexorable march to the gallows. The score is memorable and perfectly suited to the film. Image Transfer Review: The DVD is transferred directly from the original negative. The transfer contains a wealth of detail and gradations between black and white. There is unfortunately light speckling throughout the film, and about half a dozen instances of significant frame damage, but disregarding these source material defects, this is a stunning transfer. Blacks are solid and deep, and shadow detail is excellent. Bit rate is an average 5 Mbps. Audio Transfer Review: The 2.0 mono audio is generally good. The sound starts off a little crackly, but the music has good range and texture. There are some very abrupt changes in sound at reel changes; about two reels have very quiet audio and come as a shock after hearing the noisy tracks for their predecessors. The music at the finale becomes a little distorted. Dialogue is clear throughout. Extras Review: This release has several interesting extras. The best is a substantial visual essay on the production design, using frames from the movie as examples. This essay is highly interesting and gives one a higher appreciation of the work that Lourie went to in creating the look of this picture. The other notable extra is two comparison clips from the 1939 French original film, with two excerpts from the 1947 film selected out as well. We see from the first clip that much of the original survives in the remake, down to Vincent Price's checkered coat and the camera angles from his fall down the stairs. The second clip shows some more extensive differences, in the scene where Joe first meets JoAnn. The original is almost perfunctory, whereas this version gives the scene an opportunity for Fonda and Bel Geddes to play off each other. I would have welcomed more such comparison scenes. That's about it, though. No trailer, no subtitles (except on the French clips). The chaptering is just adequate. 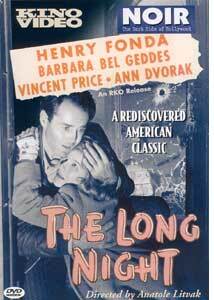 This forgotten film noir is a gem of acting, with first-rate performances throughout. Kino has given us a beautiful transfer (although it could have used a little restoration). The few extras provided are highly worthwhile. Recommended.